The snow began falling just as the busses were unloading for the 5th Annual Limud conference in Poland. (They spelled it Limud in Poland.) It has been eleven years since I left Poland after nearly a decade of community building there in the 1990’s. Amidst the emotional reunion with friends that I had not seen in a decade, were hundreds of people who I didn’t recognize. 700-1000 of them depending on who you asked. A whole new wave of young Jews, older Jews, families, kids, all who had seemingly come out of nowehere. 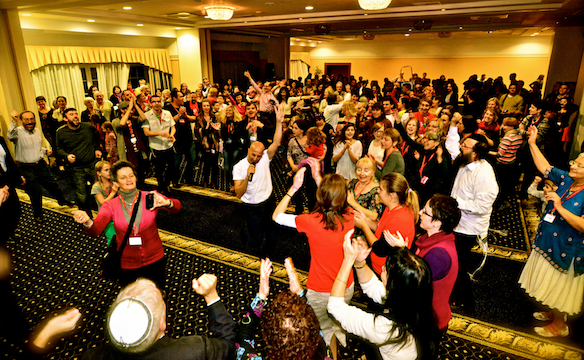 Limud was staffed by energetic young volunteers at a conference center which had undergone a recent renonation that would make it the envy of any conference center in the USA. Registration was effortless and the good organization continued until the very end. Without a doubt Limud was a blast. Everything that a Limud should be. Dozens of classes, community meals, late night conversations til dawn. A cross polination of people and ideas and intnerational trouble makers like myself. Yet what struck me the most was that the weekend was a cultural weekend. The current rejewvination of Polish Jewry, distinguishing from the one that I was part of starting in 1991, has been a secular revolution sponsored in most part by the JDC with help from the Taube and others. It was not that there were lack of religious programming – reform and orthodox minyanim took place – but their popularity was mininal. Maybe in total 100 people participated. Back in the early days of the Jewish renewal when the communist system had dissapeared, the Jewish community was into the spiritual side of renewal. Ritual. Prayer. Hebrew. All the things that the communists had banned. No more phoney Yiddish theater, people wanted authentic forms of Judaism. Today that is out the window in favor of a very cultural renewal. Classes and discussions ran the entire spectrum. The event was primarily Shabbat friendly, and the attedees were thrilled about being in a Jewish enviroment, whithout that spectre of anti-Jewish prejudice or fear of being outed. A very large number of elderly Jews and a huge number of very young folks. A cleverly named bookstore “Books & Stein” which I found flattering :-). The hotel bars opened at 10am. A real Polish disco that lasted until 4am. Dozens of wait staff cleared the tables whenever a dirty plate appeared. The food was extremely Polish, but meatless. Which in and of itself is radical in a country that eats a lot of, well, meat. Limited signage but no one was lost. About 25% of the classes were text based, while the others were discussions, lectures, or workshops. They made some killer lentil soup that I sampled. There were 2 Polish based reform rabbis, 2 Polish based orthodox rabbis, (a few import rabbis) and a karaoke style havdallah complete with some pumped up bald Israeli singer accompaning a CD of poplaur Israeli music from Hava Nagila to Ani Maamin, all in heavy euro disco beats. Another element of Limmud Polaska which stood out for me most after an 11 year absence, was the diversity and unambiguous ambiguity of the Jewish heritage of the participants. There was no distinction made between those of mixed, distant ancestry, or Jew curiosity. There were no second class Jews as there were in the 1990’2 when one needed a Jewish parent to qualify. Now people are accepted on their own terms and there is little effort to verify the Jewish pedigree of the participants. My gut feeling is that most of the people have strong Jewish roots â€” it is still not so cool to be Jewish in Poland. It was a great way to reacquaint myself with the renewal of Jewish life in Poland and I hope to make it back for Limud Polska #6.